Our 13th Lost Lizard Fun Run just happened and was a huge success. We had a record number of entries and more people than ever had a great time at our event. People loved the route and won fabulous prizes in the raffle. A few thank-yous are in order. Audrey, our event chairperson, did another phenomenal job with the event, despite having back surgery six weeks before the event. She was emailing from her hospital bed! She handled thousands of details and kept her cool when the restrooms were late. Rob for setting up and taking down base camp (a large, thankless job). Lindsey and the rest of the Vey’s team who helped with everything from gathering raffle prizes to hosting a checkpoint (and won best checkpoint). 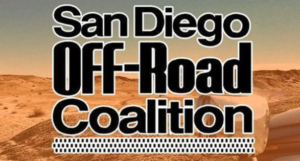 People who helped mark the route included KJ, Alex, Desert Doug, Rick and Jim N.
Other checkpoints were run by Joe Ascuitto, SD Dirtbike Meetup ladies, Mag 7 and San Diego Outback 4X4 club. Can’t forget M.A., Scott, Jim M, Norm, Jan, Chris Boyer, Robin and Kathleen. Also Michelle and Alexi from the BLM. Lots of other wonderful people I can’t recall now helped out. Thanks to all of you for making this event so well liked by so many people. We will be discussing where next year’s event will take place, Superstition or back to Ocotillo Wells. A couple months ago I got a phone call from the Off-Road Motorsports Hall of Fame. I had been nominated for an Impact award for advocacy! I was beyond thrilled. I went to Las Vegas for the ceremony. Turns out I didn’t win the award for advocacy, but during the event they announced that the Hall of Fame donates money to worthwhile causes each year and this year they decided to split the money between CORVA and SDORC! I got to go up on the stage to accept a four-foot long check for $2,500 and say a few words to the 560 people in attendance. What a great honor! I sat at a table with inductees Ed Waldheim, Bob Ham and Sal Fish. At our last membership meeting SDORC presented State Senator Joel Anderson our Legislator of the Year award. Joel has been a great friend to OHV while serving in the legislature and he will be missed when he terms out at the end of 2018. He announced that he will run for County Supervisor in 2020. Should he get that seat, we can expect more good things from him in that office. In other news, Ocotillo Wells SVRA is considering buying the Blu-In RV Park. This will add a State-run concession for full hookup RV camping to the park. The restaurant and store would stay the same. They were taking comments through November 23 and I think this is a great idea. When they were forming the general plan for the park, they talked about full hookup camping. I was against this in the park, but having it across the highway is a great idea. By the time you read this the Ocotillo Wells lawsuit will have had its day in court on November 17. At the time of this writing, I don’t know what the outcome will be. Should we lose, OW could become a “stay on the trails park,” so let’s hope the decision goes our way. There will be a trail maintenance day at Corral Canyon December 9 put on by the San Diego Adventure Riders. If you would like to come out and work on any trails, including 4X4 trails, you are welcome and encouraged. Please find the sign-in area so the forest knows how many hours you worked. There was a Lights Festival near Superstition Mountain November 11. Some of us were worried that stray lanterns would litter in the desert, so I went out to see for myself. A few years ago I went riding near Jean Nevada and we saw hundreds of old lanterns in the desert left over from one of these events. I watched this event from a short distance away and I saw the many lanterns go up a few hundred feet and then come right back down a little way away. Turned out we were afraid for nothing and I believe more of these events will take place on the private property near Wheeler Road. These lantern festivals look like a lot of fun and bring much-needed economic stimulus to the area.